Contact Aventura Bike Accident Lawyers Gerson & Schwartz, P.A. If you’ve been hurt in a motorcycle accident in Aventura you should retain legal counsel immediately to protect your rights. Whether your accident was due to a negligent driver that was speeding, texting and driving or was simply not paying attention we can help. Our Aventura motorcycle accident lawyers help accident, serious injury, and wrongful death victims and their families recover money damages to help compensate for the harms and losses. Motorcycle accident liability is based on principles of negligence which is a usually a failure to drive safely. Examples may include failing to keep a proper lookout, improper turns or distracted driving. We have also help clients injured in bike accidents due to dangerous roadways due to construction even manufacturing and design defects in certain types of motorcycles. Motorcycle accident liability can also be found based on contractual relationships between parties such as employer and employee relationships. These are all theories of legal liability that our attorneys will analyze and explain. Gerson & Schwartz PA was founded by Philip M. Gerson in 1970. For over 48 years, we have helped serious injury victims and their families that reside, or were involved in motorcycle accidents in Aventura, Florida. We have the skill and expertise serious injury victims need to recover. If you or a loved one were injured in a motorcycle accident in Aventura don't wait. Contact our law offices today. 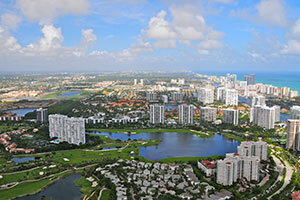 We are centrally located to Aventura. If you don't have transportation we will see up transportation for you. To schedule a free consultation with a Aventura motorcycle accident attorney at Gerson and Schwartz call (305) 371-6000, or send us an email through our online contact form. Aventura is a suburban city located in Miami-Dade County about 18 miles north of Miami. The city is a planned community that was developed in the 1970s. Many of the residents in this area enjoy spending a day riding their motorcycle in the pleasant weather. While this is an enjoyable source of recreation, a motorcycle accident can happen anywhere and at any time. Aventura is home to the luxury Turnberry Isle resort, as well as the Aventura Mall, which is one of the largest shopping centers in the United States. The city has a rather interesting position in American political history with confusing winding roads leading to as Turnberry Isle was the location of the yacht Monkey Business, which was docked there during the Gary Hart/Donna Rice scandal. You might have been riding near the Turnberry Isle resort or the Aventura mall and sustained injuries from a motorcycle accident. While some drivers are aware of motorcycle traffic, these accidents can occur anywhere around Aventura and other areas of North Miami. Why do Motorcycle Accidents Happen in Aventura? Distracted driving Motorcycle Accidents in Aventura: Distracted driving is one of the leading causes of car accidents nationwide, and is often the result of a driver trying to text and drive at the same time. Aventura Motorcycle Accidents due to Speeding: The faster a vehicle is going, the longer it takes to stop. Unfortunately, a large, heavy vehicle that is speeding may not be able to stop in time to avoid hitting a motorcyclist. Motorcycle Accidents in Aventura due to Drunk driving: Drivers who are under the influence of drugs or alcohol have much slower response times, which can make it harder for them to avoid an accident. Driving at night: Motorcycles are already more difficult to spot than passenger vehicles, and that difficulty only increases during the nighttime hours. Reckless driving Motorcycle Accidents in Aventura and Miami, Florida: Reckless driving is a broad category that encompasses many poor driving behaviors, including changing lanes too quickly, speeding, and behaving aggressively toward motorcyclists. Collisions between motorcycles and passenger vehicles are most often the result of right-of-way violations, which, in turn, revolve around the issue of negligence. A driver acts negligently when he or she fails to act appropriately in preventing an accident. Examples of this kind of behavior include not checking a blind spot before changing lanes, texting while driving, tailgating, and speeding. If any of these poor driving behaviors cause an accident and you are injured as a result, the driver may be held liable on a theory of negligence. If your motorcycle accident was minor—say, a car sideswiped you, and you fell over, but only suffered mild scrapes and bruising—you might not need a personal injury attorney since your damages are mild and the accident scenario was fairly simple. However, for more complex accident scenarios and more serious injuries, an Aventura personal injury attorney can help you go navigate the thicket of the American legal system. Florida law gives injured victims only a short window of time to file a personal injury lawsuit. Contact a motorcycle accident lawyer at Gerson & Schwartz if you have suffered injuries in an accident. With over 100 years of combined experience representing the rights of the injured, we know how to get clients the financial compensation they deserve. To speak with a motorcycle accident specialists in Aventura, call our personal injury law offices today (877) 475-2905 or fill out and submit our online contact form.